A mash-up of Super Mario Bros. and Tetris should—or at least could—be the best video game of all time, given how strong each title is independently. But is that marriage of gameplay styles enjoyable in practice? It certainly doesn't make for a good name, but Tuper Tario Tros.—seriously!—at least makes for an interesting concept. 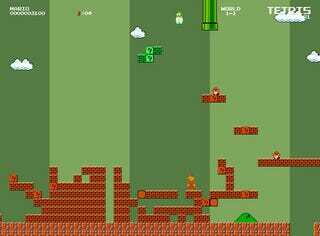 The Flash-based game recreates most of Super Mario Bros. World 1-1, letting the player fill in the blanks and reach new heights by dropping tetriminoes from a Lakitu to build new platforms and drop mushrooms. Tuper Tario Tros. is a fun experiment, but after years of being conditioned to press the space bar to jump, it's not the easiest thing in the world to play. But play it anyway.